American workers over the past year enjoyed the biggest pay raise since 2008, according to the Bureau of Labor Statistics (BLS). Employers’ total expenses on wages and salaries went up by 2.8 percent in the 12 months ending June. Excluding government employees, pay went up at the annual rate of 2.9 percent for second quarter straight. The fastest growing wages were in transportation (up 3.8-4 percent), finance, and insurance (up 3.8 percent). But administrative, sales, service, and retail workers did well too (up 3.6 percent). The slowest growth was in wholesale trade (1.8 percent), construction, and education services (both 2.1 percent). Benefits went up by 2.8 percent in the private sector, up from a 2.5 percent growth announced three months ago, in a sign that employers are luring talent by sweetening compensation packages. Benefits went up significantly in construction (3.4 percent) and manufacturing (3.3 percent). Government workers saw their pay increase by 1.9 percent over the past year and their benefits by 3.1 percent. While decent, the wage growth can still be expected to improve, commensurate with the red-hot job market. On Aug. 1, ADP and Moody’s Analytics released their payroll report, showing the private sector adding an impressive 219,000 jobs in July, easily beating the expected 185,000. The BLS is expected to release the official job numbers on Friday after posting a blockbuster growth of 213,000 jobs in June and 244,000 in May. The wage increases are being undercut by high gas and fuel oil prices (up about 24 percent and 31 percent respectively over 12 months). Aside from those, food prices inched up by 1.4 percent and all other consumer prices by 2.3 percent. The gas and fuel oil prices are tied to crude oil prices, which tend to fluctuate as oil-producing countries move production targets and face wars, natural disasters, and internal turmoil. Oil speculators then try to take advantage of the market shifts, exacerbating price swings. President Donald Trump has repeatedly criticised the Organization of the Petroleum Exporting Countries (OPEC) for capping production, which pushes prices up. Also, Trump’s withdrawal from the Iran nuclear deal caused some market anxiety. However, the administration made clear it intends to cut Iran—a significant producer—out of the market without disrupting it. With economic boom as the cornerstone of his platform, Trump has been on a continuous victory lap as the positive numbers stack up each month. He went on to mention the lowest levels of unemployment in recorded history for black, Hispanic, and Asian Americans. One of the biggest boons came last week when the Bureau of Economic Analysis announced the gross domestic product surged to an annual rate of 4.1 percent in the second quarter. In addition to celebrating his successes, Trump doubled down with yet a bolder prediction. “I will say this right now. I’ll say it strongly, as the trade deals come in one by one, we’re going to go a lot higher than these numbers and these are great numbers,” he said on July 27, speaking from the South Lawn of the White House. A significant part of the growth (1.1 percent) was due to higher exports, which translated into a $52 billion drop in the U.S. trade deficit. The country exported $568.4 billion less in goods and services than it imported in 2017. 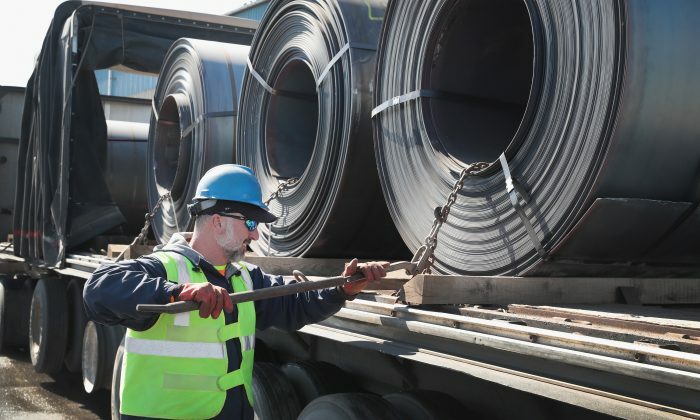 Trump has decried the imbalance and imposed tariffs on steel, aluminum, and other imports in a bid to force other countries—notably China, Mexico, and the European Union—to decrease barriers to American exports. On July 25, Trump and European Commission President Jean-Claude Juncker agreed to work toward eliminating tariffs and other trade barriers on all industrial goods except cars. Both also agreed to cooperate against unfair Chinese trade practices and reform the World Trade Organization, which has proved ineffective in remedying China’s infractions. Trump agreed to shelve any new tariffs, while the EU pledged to increase imports of American soybeans and liquefied natural gas (LNG). “Now, after years of rebuilding foreign countries, it’s time to finally rebuild our country,” Trump said at the Florida rally.